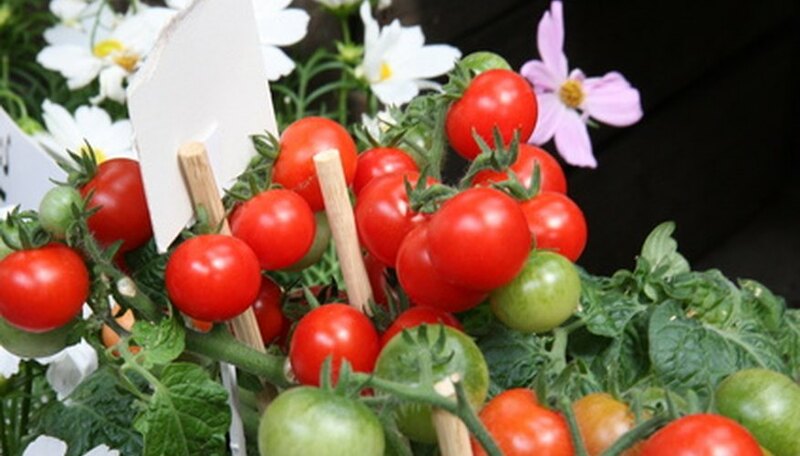 The tomato is an easy-to-grow, low-maintenance plant which makes it a popular choice with home gardeners. Farmers and gardeners find that planting certain herbs and flowers with or near tomatoes is often beneficial to the health and well-being of the plant. These herbs and flowers often act as a natural repellent to pests and add valuable nutrients to the soil that enables the tomato plant to produce a healthier and tastier variety of fruit. The herb basil is considered a good companion for the tomato plant. According to North Dakota State University, basil helps improve the flavor of the tomato. Basil is also a natural repellent for flies and mosquitoes and will keep them from eating your tomatoes and the plant when planted near your tomato crop. Like the tomato, basil requires at least 6 to 8 hours of sunlight each day and thrives in moist, well-drained soil. Marigolds act as a natural pest repellent for a large variety of garden plants including the tomato. Pot marigolds keep tomato worms from damaging your tomatoes. The French marigold performs a double duty when planted close to tomato plants. The roots of the French marigold release a substance that kills nematodes and the odor of the french marigold keeps white flies away from your crops. Marigolds like sunny spots in your garden and flourish in most soil conditions. Planting a few borage plants near your tomatoes will keep tomato worms from attacking your crop. Sources at Michigan State University say that the herb borage not only improves the favor of the tomato, but also improves the growth and strengthens the resistance of the plant to diseases and pests. Both plants thrive when planted in full sun and in well-drained soil. The herbs mint, chive and bee balm are good companion plants for the tomato. The University of Michigan states that planting bee balm near tomatoes helps enrich the flavor of tomatoes and assists in the growth of the tomato plant. Mint acts as a deterrent for insects and rodents and improves the health of the tomato plant. Planting chives near tomatoes promotes growth and enhances the flavor of tomatoes. Chives also keep aphids away from your plants. Like the tomato plant, chives, mint and bee balm thrive in well-drained soil and require full sun exposure. Commonly grown as an ornamental, the nasturtium is a flowering garden plant that is edible. According to the University of Florida, the leaves of the nasturtium have a peppery flavor similar to watercress and are used in salads or as a garnish. Nasturtiums deter nematodes and act as natural insect repellents when planted with or around tomatoes. The nasturtium plant is easy to grow and will thrive in well-drained soil and needs at least 6 to 8 hours of sunlight each day. Planting the herb dill in sunny, well-drained areas near tomatoes will improve their flavor and their growth. Once dill matures and flowers, it must be removed. According to North Dakota State University, mature dill will stunt the growth of the tomato. Carefully monitor dill plants that are place around your tomatoes; when buds appear it's time remove the dill.